Description: Horseshoe Curve-1959. Here is an original photo that I took at the Pennsylvania Railroad's Horseshoe Curve near Altoona, Pennsylvania, during the Summer of 1959. Shown here (L to R) are PRR engines #8678 and two other units whose numbers are not recorded. All are AS-18AM's rated at 1,800 horsepower each. #8678 was built in 1958. They are pushing a merchandise freight train ~ headed by three EMD EFS-17M's ~ up the Allegheny Mountains to Gallitzin, where they will uncouple and return down the Alleghenies to East Altoona for yet another helper/pusher run up the Mountains and back. Description: 12th Street. Here is an original photo that I took of a Pennsylvania Railroad train in Altoona, Pennsylvania, during the Spring of 1960. Shown here is PRR engine #8678 and two other units whose numbers are not legible. All are AS-18AM's built by the American Locomotive Company in 1958 and rated at 1,800 horsepower each. They are pushing a westbound mixed-cargo freight train under the 12th Street Bridge. Also visible is PRR N-5 Caboose #477704. The large structre in the middle distance is the Freight Station. Description: 17th Street. 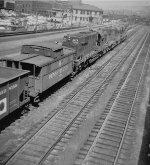 Here is an original photo that I took of a Pennsylvania Railroad train in Altoona, Pennsylvania, on 25 April 1964. Shown here (R to L) are PRR engines #8671, #8677, and #8678. All are AS-18AM's built by the American Locomotive Company in 1958 and rated at 1,800 horsepower each. They are pushing a westbound mixed-cargo freight train under the 17th Street Bridge and up the Allegheny Mountains via the Horseshoe Curve to Gallitzin, where they will uncouple and return to East Altoona for yet another run up the Mountains. The N-8 caboose is #478216. Partially visible in the background are some of the PRR's 12th Street Shop buildings. Description: 24th Street. Here is an original photo that I took of a Pennsylvania Railroad train in Altoona, Pennsylvania, on 29 November 1964. Shown here (R to L) are PRR engines #8678, #8674, and #8667. All are AS-18AM's built by the American Locomotive Company in 1958 and rated at 1,800 horsepower each. They are pushing a 76-car mixed-cargo freight train (headed by engine #9657) up the Allegheny Mountains via the Horseshoe Curve to Gallitzin, where they will uncouple and head back down the Alleghenies to East Altoona for yet another run up the Mountains. Photo taken from the steps of SLOPE Tower, partially visible on the right.